A booklet about learning to drive with the Safety First School of Motoring. Homepage. This page: Notes on how to go about learning to drive, courtesy of a driving school in Bradford, Yorkshire. Safety First School of Motoring. This small booklet was aimed at anyone in the Bradford area, who was thinking about learning to drive. 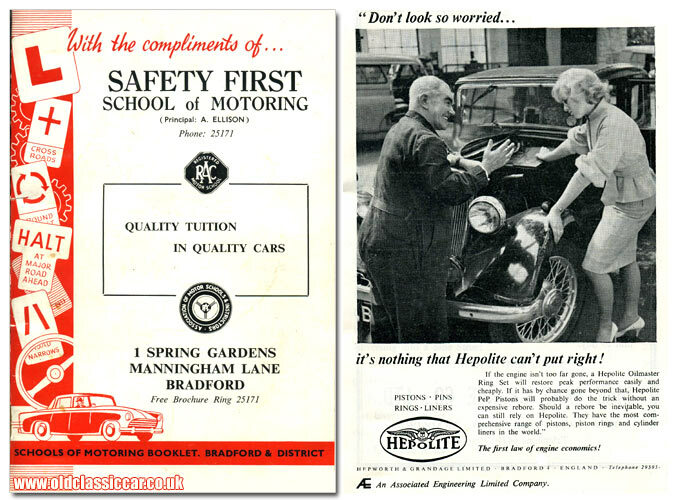 The driving school that gave out this publication was the Safety First School of Motoring, of Spring Gardens in Bradford. A. Ellison ran this RAC-registered firm, and was a member of the Association of Motor Schools & Instructors. The cover shows a selection of then-current road signs, and a hatted gentleman speeding along in his two-tone saloon car. A number of old advertisements are dotted throughout the book, many of which relate to firms in the area. Open the booklet and two such adverts are shown, one for Hedley Drake (Tyres) Ltd of Fagley in Bradford, and then the advert shown above, for Hepolite pistons. Hepolite was a trademark of Hepworth & Grandage Limited (Bradford), and the photo shows a wise old mechanic calmly re-assuring a distraught young lady. She looks remarkably interested in hearing about the inner workings of her pre-war car's internal combustion engine. Possibly her motorcar had started burning copious amounts of oil, the solution to her woes being a new set of Hepolite rings. If however the problem was more serious, the reader is advised that "Hepolite PeP pistons will probably do the trick, without an expensive rebore". Learning to drive, 1950s' style. But back to the main subject of the booklet, namely learning to drive. The introduction makes it quite clear that no booklet can teach someone how to drive, that is best left to the experts. The author is then fairly disparaging about students who opt for lessons from relatives, or family friends ... "Often these so-called drivers have never had to pass the modern driving test and are in no position to offer the quality of instruction that is demanded by the Ministry of Transport Driving Examiners. Sooner or later, after failing two or three tests the beginner has to enrol at his or her local School of Motoring. Nothing has been gained other than a few bad driving habits which even the most brilliant instructor may find difficult to remedy". The driving test was introduced in 1935 by the then Transport Minister Leslie Hore-Belisha, whose name is forever linked even today with the Belisha Beacons seen at road crossings. Therefore in 1959/1960, when this booklet was issued, there would have been many drivers on the road who had first taken to the road prior to the test's introduction, so they probably had a fair point. Differences in driving, then vs now. As anyone who runs an old car knows, driving a vintage or classic car is often light-years away from driving a modern car. Get in a modern, and you cruise around in near-silence, as a warming breeze tends to your brow, and pleasing tunes emanate from all corners of the plush interior. Compare this to driving a pre-war car, where you climb on board, being careful not to slam the door lest the window fall within. Wiggle the gearstick, pull on the choke, and adjust the ignition timing if you're sat inside something really old. Turn the ignition key to the first position, and hopefully a dull red light will illuminate somewhere on the bakelite dash. You're almost in business now, just time to pull the starter knob, or, if your accumulator (ie battery) has seen better days, hop outside and get to it with the starting handle. With a little luck the engine will cough into life, and with even more luck, continue internally combusting until no longer required. Modern cars benefit from flashing indicators, whereas true oldies make do with pop-up trafficators that "clack" into and out of position. Often they'd be less than willing to pop-up on demand, so a hefty thump of the B-pillar was often required to galvanise them into action. 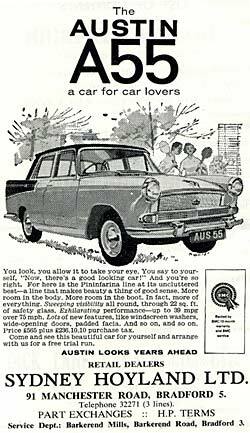 Modern cars have demisters, old cars rarely do - opening windscreens or quarterlights being the only option(s) if you wished to keep the screen clean and see where you're going. On the plus side, old cars have proper bumpers, whereas silly modern efforts have wafer-thin plastic mouldings that disintegrate with the slightest knock, and cost a fortune to replace. More ponderings about driving an older car can be found here. The booklet outlines the steps and driving basics that a prospective new driver in the late 1950s would have to get to grips with, although curiously the first subject looked at is the driving test itself. A form had to be completed, and sent to the Clerk of the Traffic Area in which you wished to take your test, accompanied by a £1 fee. The fee was lowered to just 2/6 if your ambition was to take to the road with an invalid carriage, a motor mower, a pedestrian-controlled vehicle or a vehicle exempt from duty. You're then told to be punctual, and to ensure that your car sported 'L' plates front and rear, was road legal and suitably insured. The following few pages then take the novice through the basics of car driving, including such essentials as adjusting the seat to a comfortable position, and some tips on where the key controls may be positioned. Gear positions are also covered, with handy diagrams showing how they might be arranged on cars with three- and four-speed gearboxes (well worth mentioning as many Ford Pops for example were still soldiering on into the 1960s, saddled as they were with just three forward speeds). Pop owners were advised that the following maximum speeds should be observed - 1st gear (8mph), 2nd gear (14mph) and 3rd gear/top (14mph+). Heady stuff indeed. With the art of motoring mastered, it was time for the Test itself, and a typical driving test was then explained. Before entering the car, you'd be asked to read a registration number no less than 25 yards away and, with that successfully undertaken, it would be time to settle into the car and head off on a route around the local roads. With the road test completed, a number of Highway Code questions would be fired at the driver, to test their knowledge of the Code. In the '50s and '60s there was no separate written examination, so if the road section and the Highway Code questions had both been successfully navigated, you'd then receive the news you'd been waiting for (hopefully). 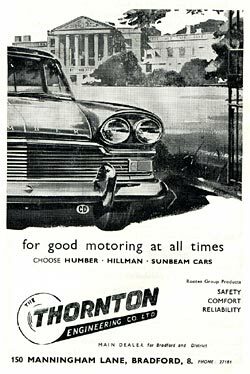 Shown above, an advert featuring the Humber Super Snipe. Available at The Thornton Engineering Co. Ltd of Manningham Lane in Bradford. Interestingly, the car in the illustration is fitted with a CD diplomatic plate. Return to the Motoring Collectables section for more old items of paperwork relating to cars of yesteryear. This page features a test pass certificate, issued by a driving test examiner during the 1960s in Crewe.